Enterprises that want to profit from valuable graphic communications and are based on a new communication model, Value Eco-Systems, significantly increase the communicative ability on the one hand, and increase the unlimited usage of relevant communication technology innovations on the other. The new possibilities for action and instructions are drafted in the scheme “Communication with a system”. It is based on organising the entire business communication through dynamic push- & pull-mechanisms that are not only limited to the interaction with customers, interested parties or partners through campaigns. All external and internal resources are integrated. This also mainly includes the technology development and the media production service. 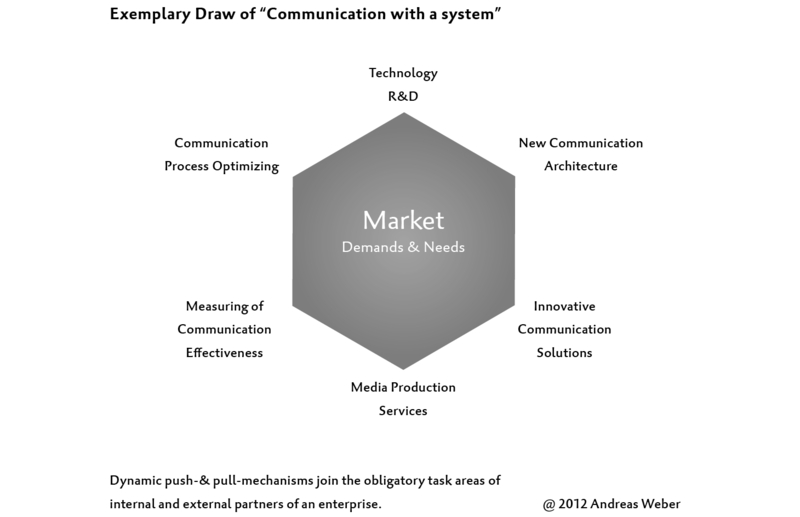 “Communication with a system” strictly speaking no longer has a beginning and an end. Therefore, we need to forget previous conceptions of how we plan traditional communication campaigns. “Communication with a system” does however, by all means, have a starting point: The development of a communication architecture specifically and individually planned for the respective enterprise. Just as the architect designs a plan for a construction, a plan for the entire business communication must be developed that is previously analysed and evaluated via the ValueAudits. In the team the architecture plan is then realized together with the adequate partners. Technology development then has the chance of not only designing innovative technology outgoing from the ivory tower perspective, but dealing with specific requirements of the enterprises. For example, in information technology, as well as in plant construction, this procedure is common already. In communication however, it is not. If technology developers and economy establish a permanent, trusting cooperation, both sides benefit. The same is applicable to the selection of the adequate innovative communication solutions that are realized through “Digital Media Producers”. It is conceivable that creative agencies focus less on the idea development for campaigns in media; they must dedicate themselves to the creative design of innovative, digital communication solutions. Media production service providers become allrounders that join founded technology knowledge with contemporary communication know-how and facilitate the usage of complex technology solutions. To make this possible, media production service providers must re-define their relationship towards technology developers. Because it can no longer be expected that the technology supplier must explain to the Digital Media Producer as purchaser of production means how to develop new markets and areas of application with innovative communication technologies. This has not ever worked in the past, and will all the more not be possible in the future, because the speed in technology development is constantly increasing. Enterprises find themselves challenged to control this new cooperation of all involved parties and to keep it going in order to achieve the ideal level of usage. The more comprehensive this task is realized with internal or also external resources, the better the effectiveness of the communication can be measured and evaluated. The existing measurement tools like Balanced Scorecards are no longer sufficient. New systems are needed that join all communication plans and measure automatically with the realization of all communication projects. The principle that needs to be followed is familiar from the finance-IT-solution world — through providers like e.g. SAP or Oracle. These solutions cannot be simply transferred from the finance and controlling world in to the world of communication. Until now, no provider was able to develop adequate concepts, as the special communication knowledge and the knowledge of contemporary communication processes is lacking. However, first approaches can be recognized that arose from the software marketing for dialogue marketing reps. from the digital production management for advertising means. Via webportals that are accessed per Internet browser not only the production of advertising means is controlled, but the corresponding measures and their success can be monitored and evaluated. Can we start? Principally yes! The approaches for “Graphic communications with a system” are existent. However, it still needs to be checked how specific solutions can be used coming from the IT environment. This means Enterprise Document Automation-solutions like they are offered for example by HP Exstream, GMC or PrintSoft and XMPie; in addition a number of so-called Product Information Management-Systems. The approach of bundling the Business Management and the Communication Management on one platform specifically for the publishing branch and the print branch with the help of integrated software architecture is relatively new. However, until now, all of these solutions can only be assigned to specific partial areas of the business communication — especially the advertising means production, the invoice and letter dispatch, the product literature and the direct marketing. However, they form the initial basis for innovative, intermedial communication that allows one to measure, evaluate and control the communication success at all times. A point to be emphasized is that the communication means (Print, Online/Digital) can be designed individually and “customized”. This is a basic requirement for valuable graphic communications. This then fulfils the most important requirements of the task of enabling valuable communication with the help of the communication with a system of a company-specific, innovative communication architecture.